The first business meeting for September was held September 5, 2017 at the Great Valley Middle School in the Library, 255 N. Phoenixville Pike, in Malvern, PA.
Frank A. Piliero, Chairman, Kevin R. Kuhn, Michael J. Rodgers, and Hugh D. Willig. Charles A. Philips was absent. Mark P. Thompson, Esq., Randy Patry, and Bob Dettore. Linda Csete, Manager, Jim Thompson, Public Works, Tim Hubbard, Fire Marshal, and Lisa Gardner, Recording Secretary. Mr. Kuhn stated there was an executive session just prior to this evening’s meeting to discuss legal matters. Mrs. Csete stated there were executive sessions following the August 7th and August 25th meetings to discuss legal matters. Mrs. Csete reminded everyone that Charlestown Day is Saturday, September 16th at Charlestown Park. No issues were brought forward at this time. Mr. Kuhn moved to approve the minutes for the August 7, 2017 Business Meeting and Mr. Rodgers seconded. Mr. Piliero called for discussion and there being none, called the vote. All were in favor. Mr. Rodgers moved to approve the minutes for the August 25, 2017 Business Meeting and Mr. Kuhn seconded. Mr. Piliero called for discussion and there being none, called the vote. All were in favor. Mr. Rodgers moved to approve the August 2017 Treasurer’s Report and Mr. Willig seconded. Mr. Piliero called for discussion and there being none, called the vote. All were in favor. Mr. Kuhn moved to approve the General Fund Accounts Payable Report for September 5, 2017 and Mr. Rodgers seconded. Mr. Piliero called for discussion and there being none, called the vote. All were in favor. Mr. Kuhn moved to approve the Open Space Fund Accounts Payable Report for September 5, 2017 and Mr. Rodgers seconded. Mr. Piliero called for discussion and there being none, called the vote. All were in favor. Mr. Willig reported on the recent activity of the Phoenixville Regional Planning Commission. They are currently looking at land use and the accompanying maps in the pursuit to revise the Regional Comprehensive Plan. Mr. Kuhn moved to accept the August 2017 reports #1-13 as submitted and Mr. Rodgers seconded. Mr. Piliero called for discussion, and there being none, called the vote. All were in favor. Mr. Thompson opened the hearing that was continued from August 7, 2017. The proceedings were taken by Mr. Mark Hagerty, Court Reporter. Mr. Thompson read an email dated September 5th, 2017 from the Andersens’ counsel, Ms. Wendy McLean, Esq. She stated she had a meeting scheduled on September 6, 2017 to discuss the project with the client and they would then decide whether to withdraw or proceed with the project. Mr. Kuhn moved to continue the hearing to October 2, 2017 at 7:00 p.m. at the Great Valley Middle School, 255 N. Phoenixville Pike, Malvern, PA, Room 154. Mr. Willig seconded. Mr. Piliero called for discussion, and there being none, called the vote. All were in favor. Mr. Patry gave background on the draft Floodplain Ordinance, which has an adoption deadline of September 29th, 2017. FEMA cannot demand municipalities adopt any ordinance, but if not adopted, floodplain insurance for affected residents would be suspended. Mr. Thompson asked if there were any questions from those present. No one came forward. Mr. Thompson closed the hearing. Mr. Patry told Supervisors that Mrs. Csete is appointed as the Floodplain Administrator. Mrs. Csete plans on delegating the responsibility to Mr. Wright of Advanced GeoServices. Mr. Rodgers moved to adopt Ordinance #205-17 Amending Chapter 27 of the Charlestown Township Code, Part 11 “Flood Hazard District” and Mr. Kuhn seconded. Mr. Piliero called for discussion, and there being none, called the vote. All were in favor. After a brief overview by Mr. Kuhn, Mr. Piliero moved to approve the agreement for the French and Pickering Creeks Conservation Trust, Inc., entitled the Conservation Easement Preparation and Processing Agreement for parcels 35-2-68; 35-2-85; 35-2-91.1; 35-2-94 & 35-4-149. Mr. Willig seconded. Mr. Piliero called for discussion, and there being none, called the vote. All were in favor. Mr. Thompson reviewed the draft decision for Mr. and Mrs. Carl and Donna Lillmars to construct a single family home and on-lot sewage system in areas of steep slope at 2212 Bodine Road. Mr. Kuhn moved to approve the Conditional Use Decision for Mr. and Mrs. Carl and Donna Lillmars, and Mr. Rodgers seconded. Mr. Piliero called for discussion, and there being none, called the vote. All were in favor. Mr. Thompson stated that the previous effort to sell the Auchincloss property resulted in no bids, and the Board was interested in a new effort this fall. He reviewed the proposed agreement with realtor Ms. Cynthia Thompson Ilaqua. Mrs. Ilaqua will receive 5% of an estimated 2.2 million dollars for the two properties that can be sold separately. Mr. Piliero moved to execute the listing agreement, and Mr. Kuhn seconded. Mr. Piliero called for discussion and there being none, called the vote. All were in favor. Mr. Dettore referred to the three bids that covered all work, besides the electrical, that were received for the construction of the south parking lot at Charlestown Park. Melchiorre Construction Company was the lowest bidder at $440,000. The two other bids received and opened on August 15, 2017 were Horst Excavating at $708,263 and Berg Construction at $586,420. Mr. Kuhn moved to award the contract for the improvements to the south parking lot at Charlestown Park to Melchiorre Construction, and Mr. Rodgers seconded. Mr. Piliero called for discussion, and there being none, called the vote. All were in favor. Change Order #14 to Cook’s Services Company Contract to Include Electrical Work for the Charlestown Park South Parking Lot Improvements. Mr. Dettore requested the approval of the proposed change order for $87,100 to the Cook’s Services Company contract. This is for electrical work at Charlestown Park encompassing the improvements to the south parking lot. The contract extends to the end of the year, but work is expected to be completed by Thanksgiving. Mr. Kuhn moved to authorize Mr. Dettore to execute Change Order #14, and Mr. Willig seconded. Mr. Piliero called for discussion, and there being none, called the vote. All were in favor. Mr. Detorre told Supervisors that today the surety began working on the punch list dated December 2016. This work included the threshold on the restroom doors. The graphics and signage bid package is in the office of F. W. Houder Inc. They will conduct a private bid. Bids are due in the office by September 14th. There are 3 bidders expected, with the award being in October. Mr. Detorre provided information on the bridge, a.k.a. the Davis Bridge. It is due for maintenance in response to the 2015 biennial inspection report provided by PennDOT. The bridge is Township owned and the Township is responsible for all maintenance costs; it is not eligible for any PennDOT funds. There are no suggested repairs that are rated critical. The bridge is not unsafe, and it is acceptable for the 126 estimated cars that use it daily. After reading a report from the 1980’s stating the bridge was deficient, Mr. Detorre visited the site. Now, as an obligation of disclosure several items needed to be brought to the Board’s attention. Storms have eroded the mortar, making the bridge “thinner” than originally designed. This resulted in three estimates presented to the Board in a letter from Mr. Dettore dated August 30, 2017. Does not include correction of channel width and height deficiencies. Useful life will be extended through regular periodic maintenance. Mr. Detorre also referenced a Specialty Engineering Report dated April 27, 2016 prepared for PennDOT. It reflected a sketch of a replacement bridge designed in 1988. Mr. Patry offered his assistance in acquiring the necessary permits. Both consultants reminded Supervisors of the need to protect the stream during the entire project. Mr. Detorre said the bridge would need to be enclosed while being repainted. Mr. Kuhn moved to approve a request for scope of work, to be performed by Edward. B. Walsh and Associates, Inc., and Mr. Rodgers seconded. Mr. Piliero called for discussion, and there being none called the vote. All were in favor. Mr. Patry referred to the four bids received for the construction of the Brightside Farm Trail. Lechmanik, Inc., was the lowest bidder at $478,186.65. 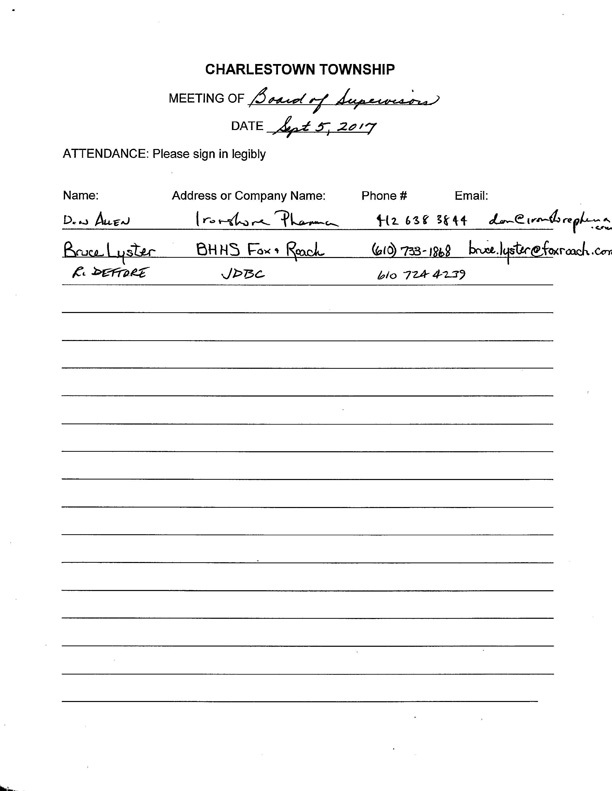 Mr. Kuhn moved to award the contract for the Brightside Farm Paved Trail Project to Lechmanik, Inc. and Mr. Rogers seconded. Mr. Piliero called for discussion, and there being none, called the vote. All were in favor. Mrs. Csete referred to the two proposals received by GreenWeaver Landscapes LLC, dated August 24, 2017 providing 2018 landscape maintenance services for the meadows at the Devault Gateway and the landscaping at Charlestown Mill. Each proposal shows a rate of $85.00 per hour not to exceed 5 hours. This represents one visit to each site per month from April through November at a maximum cost of $3,400.00 per property for the year. The Board wanted to have this project reviewed by Mr. Theurkauf, therefore the item was tabled until the next meeting when he can be present. Mrs. Csete stated the Township is required to vote each year to provide for the Minimum Pension Plan Obligation in the next year’s budget. Mr. Kuhn moved to authorize funding the Employee Pension Plan for 2018 in the amount of the Minimum Municipal obligation provided by Trustees Insurance of $10,633 and to include this amount in the budget for 2018. Mr. Rodgers seconded. Mr. Piliero called for discussion, and there being none, called the vote. All were in favor. This subject is on the September Agenda for the Planning Commission for a recommendation prior to an estimated November adoption. Mr. Rodgers moved to authorize advertising of a hearing to consider the Wireless Communications Ordinance for November 6, 2017 at the Great Valley Middle School, Room 154, 255 N. Phoenixville Pike, Malvern, PA at 7:00 p.m. Mr. Kuhn seconded. Mr. Piliero called for discussion, and there being none, called the vote. All were in favor. Mr. Kuhn moved to approve the Cedar Run Escrow Release #2 in the amount of $311,488.05. Mr. Rodgers seconded. Mr. Piliero called for discussion, and there being none, called the vote. All were in favor. Mrs. Csete discussed the letter she received on behalf of the Board of Directors for the Wharton Esherick Museum. They are requesting the installation of signage near the intersection of Route 29 and Yellow Springs Road by PennDOT under the Tourist Oriented Directional Sign (TODS) program. Mr. Patry suggested Mrs. Csete instruct them to apply for a signage permit. Mr. Piliero adjourned the meeting at 8:10 p.m. The next meeting is scheduled for Monday, October 2, 2017, 7:00 p.m. at the Great Valley Middle School, Room 154, 255 N. Phoenixville Pike, in Malvern, PA 19355.